Organise and maximise your storage space in style. Fully customisable layouts, with delivery in 4 weeks or less! Get your wardrobe exactly the way you want. 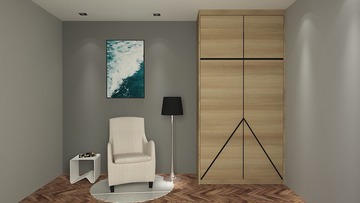 All designs will be made-to-measure to your room dimensions, with ability to customise the colours and internal layout. No matter what you choose, you can be sure of a wardrobe that lasts and looks great. Our wardrobes are designed globally and manufactured locally to the latest production standards. Trained professionals oversee the build and installation from start to finish to ensure your wardrobe looks exactly the way you want it.